Waitrose stocks a wide selection of bagels - try Caramelised Onion & Poppy Seed instead of plain. Earthy portabellini mushrooms taste great in this recipe, otherwise try Waitrose Wild & Exotic Mushroom Selection. Lightly crush the caraway seeds in a pestle and mortar. Melt half the butter in a small pan over a medium heat and gently cook the shallot and caraway seeds for 3-4 minutes until the shallot is soft. Add the mushrooms and increase the heat. Cook for 3-5 minutes until the mushrooms begin to brown. Stir in the lemon juice and let it evaporate for a minute. Toast and butter the bagel. 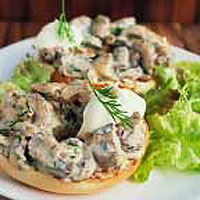 Stir 2 tablespoons of soured cream and the chopped dill into the mushrooms. Season and spoon onto the bagel, top with the remaining cream and dill sprigs. Serve with green salad leaves.